C. Underwood is part of the Limited Edition Collection from Savage Liquids. 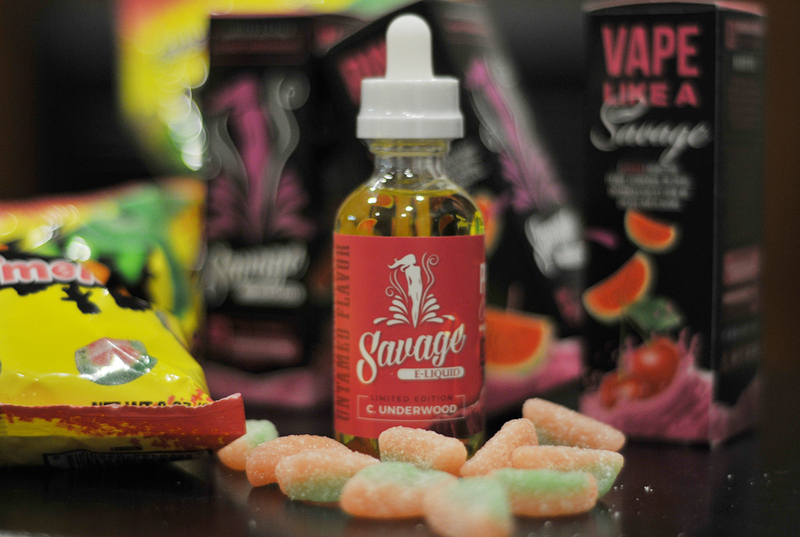 The good folks at Savage E-Liquid surprised us with couple bottles of their Limited Edition Vape flavors. We recently reviewed Underwood, a blue razz flavor, so we thought we'd see how the counterpart C. Underwood holds up. Obviously named after Claire Underwood from the Netflix Original House Of Cards, this vape is quite a bit sweeter with just a hint of tart razz. The watermelon candy flavor comes through first on the inhale and the tart razz just barely on the exhale. It's like a reverse Watermelon Sour Patch Kids. The watermelon isn't overpowering which is nice for a premium blend. You don't want your fruity vape to burn you out, so C. Underwood makes a good all-day vape. Ultimately C. Underwood offers the balance you expect out of a premium vape flavor. It should be vaped warm to open up the candy flavor and keep the proper balance. If you want a candy watermelon vape with a tart finish that you can enjoy throughout the day, C. Underwood might be right for you.